And so the dream ends. A fitting conclusion to an overall perfect series, though, I found it lacking in places. I don’t like how the episode tried to cover almost a two year time span in 24 minutes. While it was nice to see the gang grow-up, I thought it was weird how it would take Yuuichi that long to figure out how to wake Ayu up, or that Mai would withhold her clue for almost a year. Or, hell, why did Akiko wait so long to tell Yuuichi Ayu was still alive? I prefer Toei’s way of doing it, which was quick and to the point. 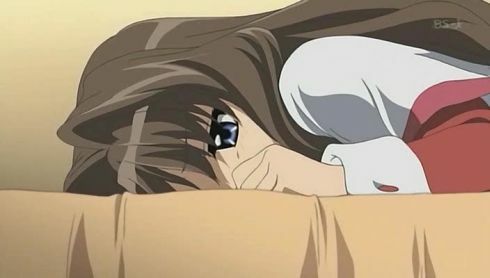 All Ayu needed to wake up was for Yuuichi to be by her side. And why did Ayu need the wheelchair at the end? Realistically speaking maybe she would need it, but this is anime. I don’t want it to be realistic. 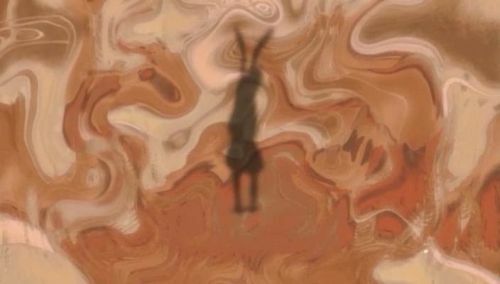 Toei also did that better, showing a smiling Ayu running at the end. There were also a little too many miracles this episode for my liking. Oh, Akiko’s all better now! Must be a miracle. Oh, Mai and Sayuri healed faster than normal! Must be a miracle. Oh, Shiori’s not dying anymore! Must be a miracle. That in the end all the miracles were linked back to Ayu’s wish was fitting, showing how much Ayu loved Yuuichi, but it wasn’t necessary. 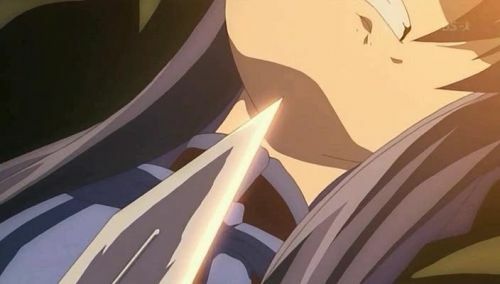 It’s not like Mai and Sayuri’s injuries were that serious, and Mai could of just used her healing powers. In Shiori’s case, I always thought it was implied that all Shiori needed to get better was the love of her sister. Kind of cheapened that. And Akiko could of still been in the hospital recovering. I feel like I’m repeating myself a lot, but that’s how toei did it. Having Nayuki take care of her mom in the hospital and discovering Ayu was alive that way. 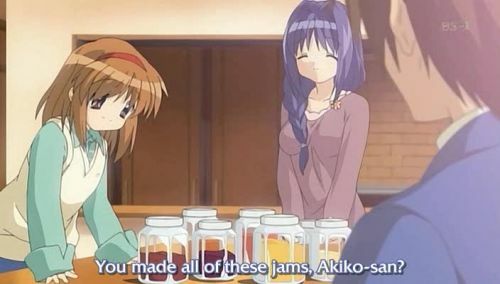 Though, that takes the fun out thinking of Akiko has the mastermind behind everything. Oh god Mai is moe! I know it sounds like I hated the final episode, but it wasn’t that bad. Really the highlight was seeing everyone again. Shiori in school clothes, Kaori and Kitagawa, Mai cosplaying as Yuki, etc. I liked how it hinted at where everyone’s lives were going. The animation seemed a touch better too. I loved the scenes of the town and how it changed through the seasons. Could it of been handled better? Sure. I feel it was too ambitious of Kyoani to try and cover such a long length of time realistically. Maybe that was how the game handled it, but I doubt that was the case. At least Kyoani managed to wrap all the important aspects up in the end. 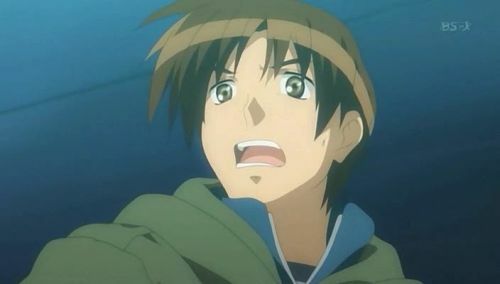 Overall, Kanon was a success, one of the most perfect adaptions possible. It included every bit of story it could, surprising me in some places where I thought I knew what would happen. 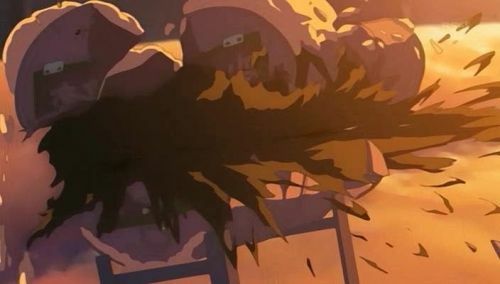 The animation was gorgeous with truly breath-taking scenes of a snow-covered town. There’s not much snow in winter where I live, so that was a real treat. All the girls were undeniably moe, with their own cute mannerisms and noises. I learned more about each of them, too. I came to appreciate Mai’s story more and the tragedy in it. Makoto’s is still my favorite, both storywise and character-wise. There’s just something about the tsundere foxgirl that gets to me. I hope it’s not her reqressing to a child at the end. That’d be pretty bad on my part. So Kanon fulfilled what is set out to do, adapt a game even better than previous attempts. There are some bumps in there, but I think it succeeded on all counts. A definite watch for any anime fan. I doubt it will be licensed, though, and spread to a larger audience. Not that it matters to me anyways. Guess now I have Lucky Stars to look forward to from Kyoani, along with a Clannad adaption sometime in October. 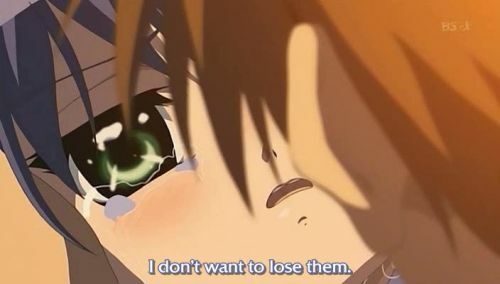 That will be nice to watch, since I don’t know Clannad’s story at all. Man, Kyoani really needs to animate a shounen fighting series. They do such awesome fight scenes, but they go to waste in all these eroge adaptions. Not that that’s a bad thing. We’re nearing the end now. The appearance of the actual Sawatari Makoto was a real surprise to me. Though, she looked more like older Mikuru than older Makoto. I’m kind of confused on who she is supposed to be. Yuuichi calls her Sawatari’s older sister, so is she the older girl Yuuichi had a crush on? That would make sense, and I think I remember Yuuichi saying he got the name Makoto from another girl. With all the hints Kyoani was throwin’ around I almost believed she was just fox Makoto reincarnated, though maybe she knew Makoto in some way. I’m really overthinking this too much. She’s a cute girl and I’ll leave it at that. 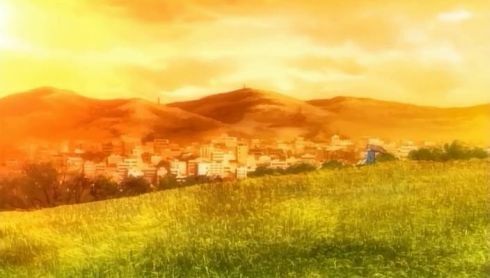 I have to admit that I really like the Yuuichi/Ayu reunion and goodbye scene. 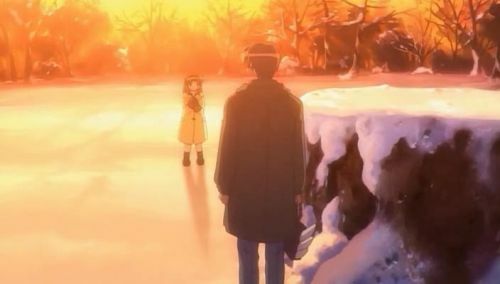 One, the scene was absolutely beautiful with the sunset and then snowstorm. A very nice effect on how the weather increases with the emotion. Ayu’s final wish was expected, but of course Yuuichi couldn’t forget about her. I really wanted him to say ” I can’t fulfill that wish idiot, because I’ll never forget you, ” followed with an ” uguu~ ” from Ayu and then they kissed. So it didn’t exactly go that way, buy Yuuichi did confirm that he won’t forget her and they hugged. Don’t know why they hugged when they kissed a few episodes earlier. Though, I do wonder what Ayu’s final wish was. Probably something suitably romantic. A couple of things I didn’t like: a few shots made Ayu look way too much like a kid. Kind of hard to take Yuuichi seriously when he’s confessing to a girl that looks ten. Also, Ayu should of sprouted angel wings and disappeared into the sky, like the toei series. 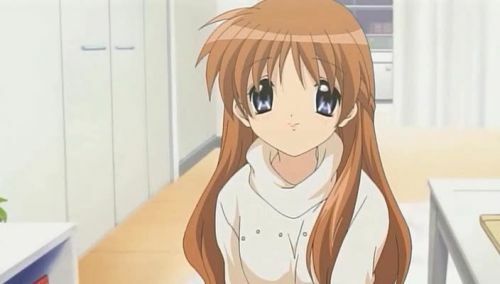 You have angel Ayu in the OP, so put her in the show. Those are some pretty mild complaints though. And Nayuki got some tough love beat into her into Kaori and confesses apologizes to Yuuichi and promises to become stronger and ” Fight-o! ” till her power level is over 9000. Or something to that effect. I guess Nayuki’s ” arc, ” if you can call it that, was more about her overcoming her grief instead of any love-love situation with Yuuichi. Too bad. Final episode next week. 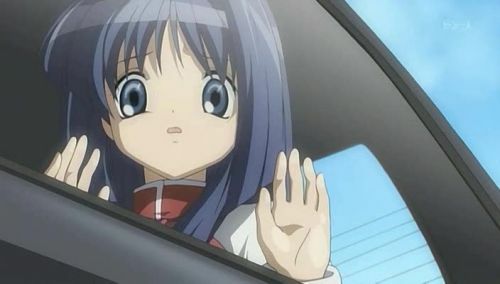 Time to say goodbye to Kanon. It’s been a fun ride and I’ll be sad to see it done. 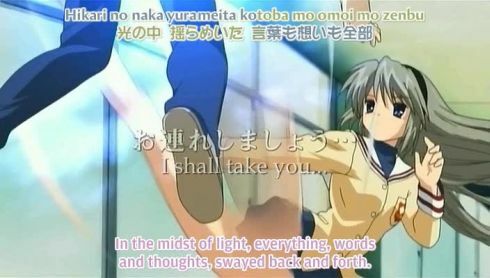 But then again, looks like I may have a Clannad Kyoani ver. to look forward to. The aftermath of the accident. Nayuki has predicatably fallen into a sullen, almost comatose, state of mind. Some of the looks she had this episode were quite terrifying, a mix of shock, depression, and madness. Pretty cool actually, but I prefer the smiling and dopey Nayuki. The problem is that Nayuki seems hellbent on blaming herself for everything, and won’t listen to anything else anyone has to say. Despite Yuuichi’s earnest tries to cheer Nayuki up, he came off as a jerk to me this episode. How can he try to cheer her up when he forgot about her for seven years? And Nayuki sent him letters the whole time, which he didn’t even try to answer at all! The fact that Yuuichi wouldn’t even communicate with Nayuki for that long baffles me. 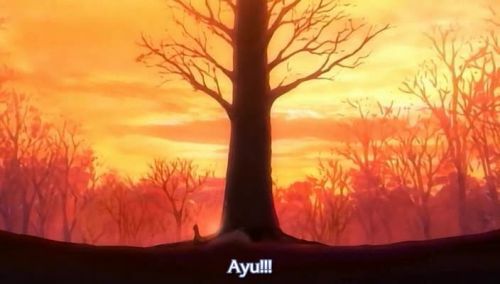 And then, the moment he remembers Ayu, he abandons Nayuki again, and is even willing to die for Ayu instead of care for Nayuki. Poor Nayuki always gets the short end of the stick. 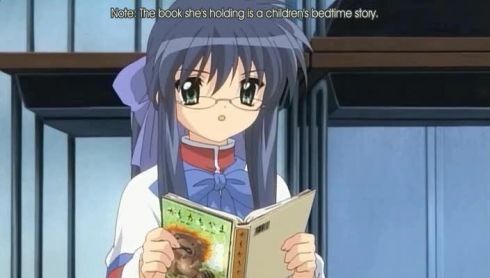 I would like to see just ONE Kanon adaption where Nayuki doesn’t get the shaft in the end. Guess I’ll just have to play the game to see Nayuki’s good ending. 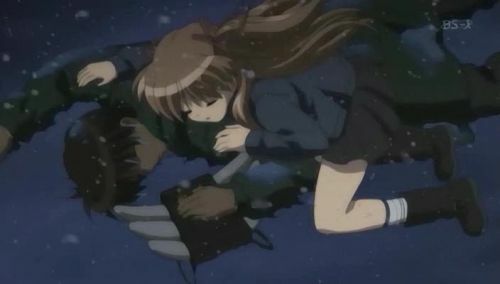 The other half of the episode was completely devoted to Ayu, or should I say Ayu’s death scene. Seeing Ayu fall from that tree, even though I knew it was coming, was pretty shocking. However, there’s one thing I wish Kyoani would of added. 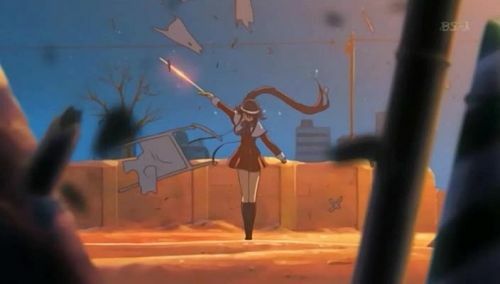 In the toei version, after Ayu falls, Yuuichi puts his hand behind her head and pulls it back to find it covered in blood. 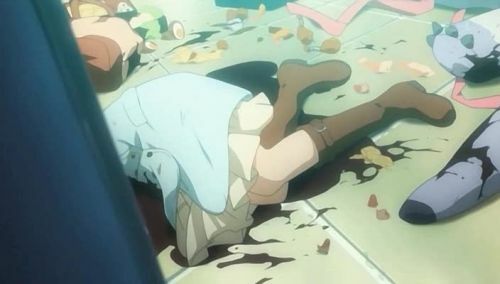 A gory scene, but an impactful one that really brought home the imminence of Ayu’s demise. I just think the shock factor would of been perfect. Though I suppose Kyoani was going for more of the sadness angle, with the whole pinky promise and Ayu not being able to move her hand to do it. And Ayu sure was able to talk a long time for having her skull crushed in. Must be her Uguu power. Auu~ You are finally mine Yuuichi fufufufufufufu! 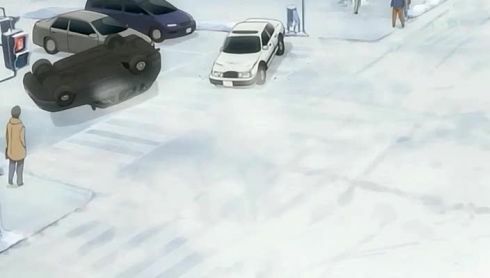 The part where Yuuichi rushes out into the storm is one of my favorite scenes in Kanon. 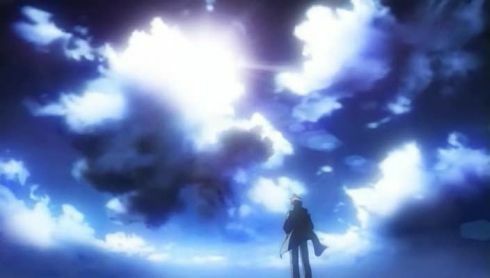 Seeing him yell Ayu’s name into the storm just solidifies how much he cares for her and the lengths he’ll go to. Though, afterwards Yuuichi decides to collapse and die in the storm, which is pretty stupid. Good thing he has Makoto to keep him warm. I’m surprised at the big comeback Makoto made this episode. Not only did Yuuichi think of her when trying to cheer up Nayuki, but she came back to protect Yuuichi. 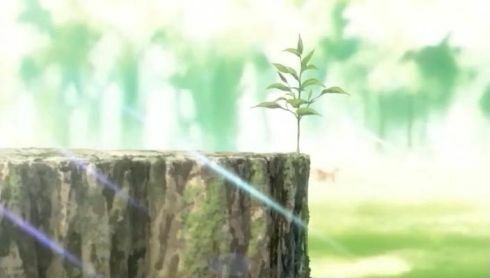 Back in the toei series it was kind of established that Makoto never really died, just went back to living with nature. Kyoani seems to have gone the same route. Makoto goodness is always nice though. I haven’t heard that ” Auuu~ ” in a long time. I was surprised when I saw the title for next week’s episode, Red Finale. 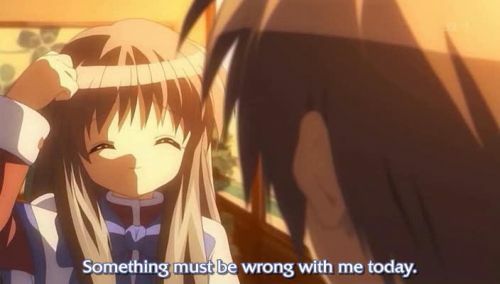 For a moment I thought Kanon was just going to have 23 episodes, but fortunately it won’t. I’m pretty sure I know what happens next, and it’ll be nice to see a certain scene again. Hopefully Nayuki will get better and Yuuichi can stop acting like a jerk to her. Oh, and Danbooru’s been revived as sagubooru. Woohoo! 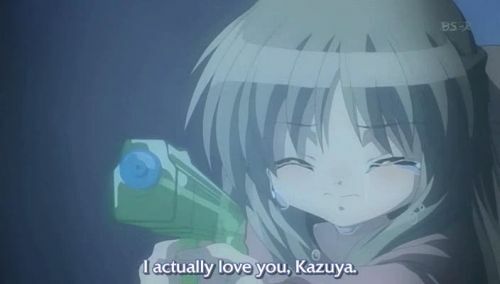 I’ve always thought that Nayuki gets the short end of the stick, no matter which Kanon adaption it is. 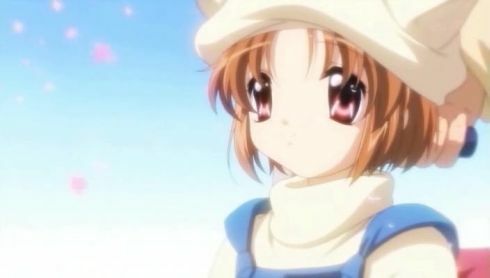 Since her story is so entertwined with Ayu’s, and since clearly Ayu has to be the main heroine, Nayuki will never get her own ending, or even closure, as in the cases of Makoto, Mai and Shiori. I wonder what Nayuki’s ending from the game is like? 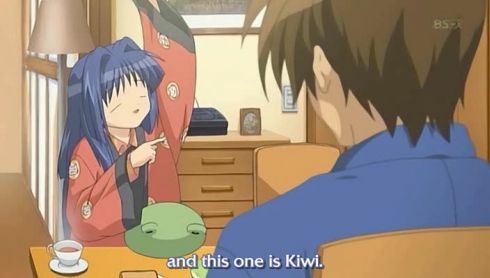 But at least for one episode the attention can be on just Nayuki and all her cutesy mannerisms. 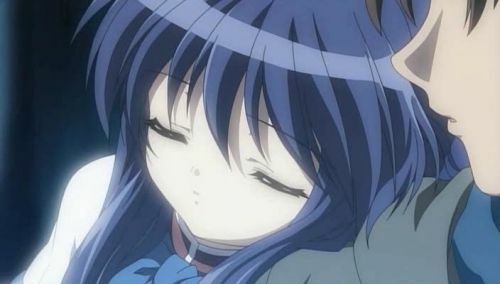 Mainly the sleepy Nayuki thing, since everyone knows that sleepy Nayuki is the most moe thing evar. How cute was it to see her name the cats on her own coat, while sleepy I must add. So I guess I’ve become something of a Nayuki fanboy just because everything she does is so cute, and perhaps not as overly saturated as uguu. Aside: Good as place as any to put this. I’ve joined Visual-Novels.net staff as a freelance reviewer/newshound. So in the future stuff I write over there will probably get posted over here and viceversa. Please check out the site. It’s one of the better Visual Novel sites in english next to VisualNews. Lots of Shuffle stuff also. The Shiori arc is over now, or at least I think it is. 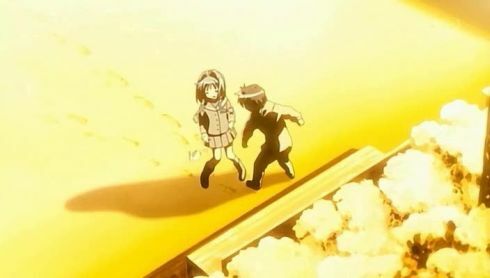 The ending of episode 18 was kind of vague, with Shiori just leaving Yuuichi. The preview seems to hint that Shiori does indeed die, but in the toei anime, and the game I presume, she lives on, cured through her new emotional attachment with Kaori. Shiori’s story is the shortest of all the Kanon girls, and probably the least exciting, at least from looking at just the plot. Aside from dealing with Shiori’s illness, there’s only the dilemma of how to get her and Kaori back together. It lacks the climatic punch of Makoto’s deterioration or Mai’s final battle. However, it is still emotionally powerful. 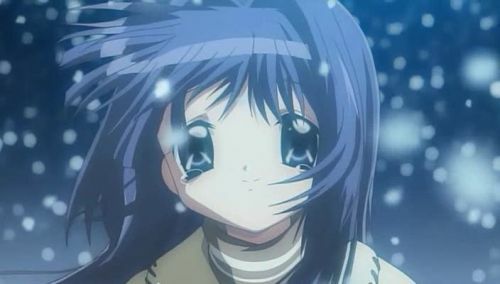 Kyoani used slower, quieter scenes to express the sense of hopelessness around Shiori and the despair between her and Kaori. This story is all about death and how people deal with it. It lacks the supernatural of Makoto’s, Mai’s, and Ayu’s stories. 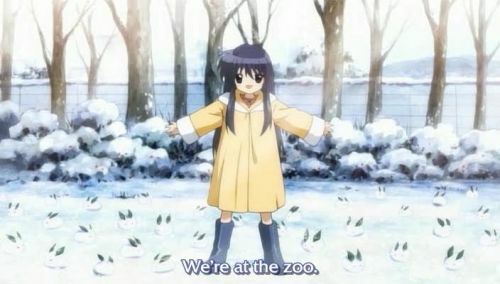 I have to admit Shiori won me over with her incredibly cute actions. I blame Kyoani for making her so adorable, because I didn’t find her appealing at all in the toei version. Shiori’s relationship with Kaori is very interesting, as they both avoid each other so as not to hurt themselves, but end up doing just that. Kaori’s actions are very understandable and human. Rationalizing that she would only get hurt if she stayed close to Shiori, she naturally distances herself. Shiori, not wanting to bother her older sister, does the same, though clearly she doesn’t like it. I’ve always like Kaori. Her cool girl attitude is just, well, cool. Still, her stubborness towards Shiori is pretty annoying and would have continued if Yuuichi hadn’t come around. I’m glad she realized her mistake at the end, and I hope Kyoani didn’t kill Shiori off just after her and Kaori are together again. To me, the climax of the story came not with Kaori’s acceptance of Shiori in front of everyone, but Shiori’s confession that she tried to kill herself. 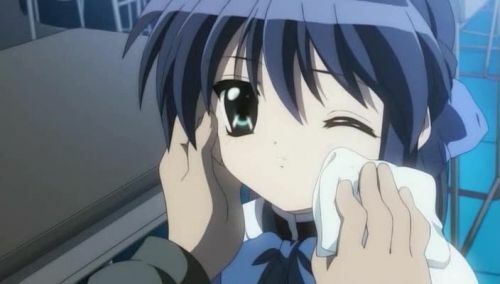 Seeing Shiori both laugh and breakdown into tears is exactly the kind of emotional punch Kanon excels at. That’s the first time I truly realized how much Shiori suffered and how much of her personality was an act to cover up her fear. It’s a kind of cathartic moment for Shiori, where she both comes to terms with her imminent death and her relationship with Yuuichi, as shown by the kiss she gave him. 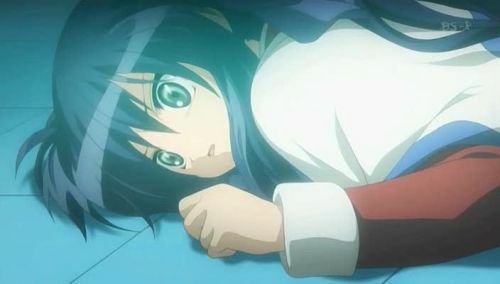 Having wrapped up both the plot and Shiori’s emotional development, Kyoani has her disappear into the night, never to be seen again. Actually, I didn’t like that. It’s a nice cliff-hanger moment, but also reaks of, ” Ok, this girl is done. Moving on. ” And it looks like Kyoani will be heading straight into the Ayu/Nayuki arc next episode, leaving little time for a proper Shiori denouement. I hope she doesn’t just die with a ” Oh yeah, Shiori’s dead lol. Have some jamuu. ” That’s just cruel. Also, Kitagawa is fuckwin awesome. Best useless male sidekick evar. Wow, now that was a tearjerker. Since Mai’s story is now done, I understand it a lot better now than I did in the toei version. I like Mai herself a lot more also, as compared to toei’s version, where the messed up story meant I never understood her fully. At first you think Mai just has no emotions, but then after watching her you realize she’s actually a very emotional person with her own (very cute) reactions. It wasn’t that she didn’t have emotions, but she didn’t know how to express them, leading her to either not say anything or act in a childish manner. 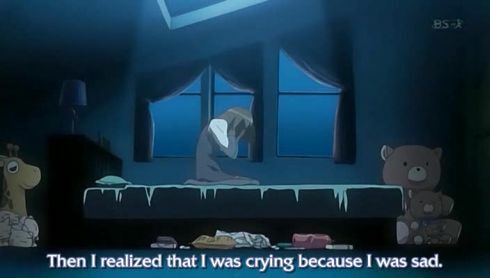 Add in the tragic Mother illness and being abused by others for her powers, and you see why Mai is such a lonely person. 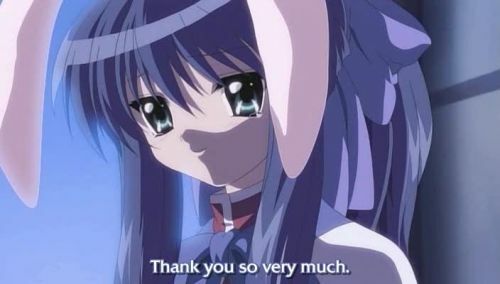 Only the help of Sayuri and Yuuichi managed to get Mai to show her emotions, both through befriending her and getting her to accept her apparent powers. On Mai’s powers, their the usual Key fair, or I guess Key started that fair here, of being extremely vague and extremely powerful. Let’s see, Mai can cure people through her tears, manifest demons to destroy everything, and summon a loli version of herself. Pretty damn neat. I wonder if it’s her powers that stop her skirt from ever flying up, even when falling down. It baffles me. Now that Mai’s story is over were moving straight into Shiori’s, which means more Kaori goodness for me. Shiori is pretty plain, but her sister is just hawt. I wonder if later in the series we’ll see the ” Mai and Sayuri go have a lesbian wedding in Europe ” ending. And that probably only makes since if you’ve seen the toei Kazahana special. Someone at Kyoani sure knows their headtrips. These aren’t tears! It’s just raining…inside my room. Pink bunny ears can solve any problem. BAD END: Take Ciel-Sensei’s Lesson? Who would of thought that under Sayuri’s cheerful facade there was a weak little girl with a tragic backstory. Sayuri had to raise her brother all by herself, and in her naturally childish way of thinking, she had to be strict on him. 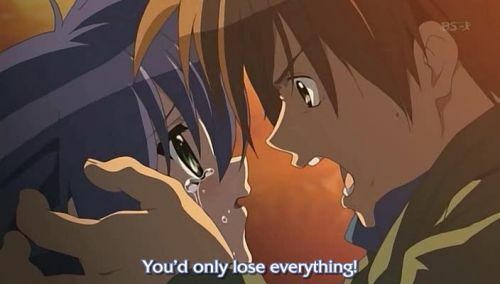 This of course lead to a ton of angst when her brother died, what with the not playing with him at all and stuff. Where exactly was Sayuri’s dad during all of this? Why was she the one who had to act as a mother to her brother? Aren’t there maids for this? Did he really think a little girl could handle it? The whole thing has tragedy written all over it. I really understand Sayuri now and her reasoning for being friends with Mai. Why did the toei version think it necessary to cut out this part of Mai’s story, when it seems to be the climax of the whole thing? I’m so glad Kyoani decided to remake the series now. Now, the final moments of the episode were just awesome. Not awesome for Sayuri, Mai, and Yuuichi, but emotionally it was great. Mai’s face as she collapsed, her rampage as she slashed everything to pieces, Yuuichi grabbing her crying face and promising they’ll end this tonight. It was so dramatic and epic. Highpoint of Kanon so far I think. Next week I guess will see the conclusion of Mai’s arc if Yuuichi’s says their gonna end everything. So we’ll have the revelation of Yuuichi as Mai’s friend and more Mai angst, which is always pretty dramatic. Some sidenotes: Akiko’s jamuu is truly evil. Seeing her spread so much on the toast makes ME cringe. 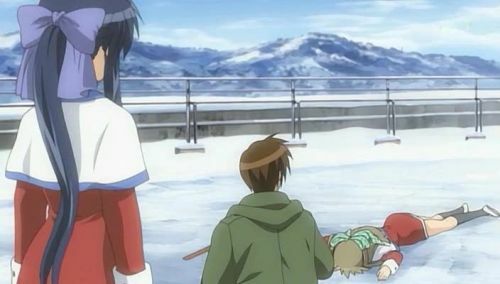 Also, kyoani has to do an action anime after Lucky Stars, because I need more fights like Mai’s. So fast, so fluid, it’s crazyily awesome. 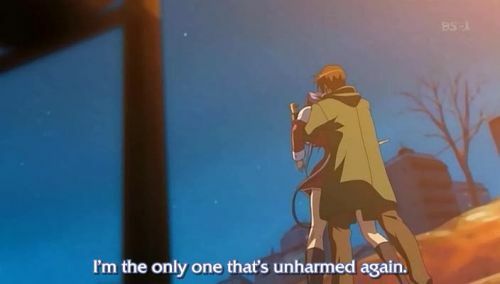 Please don’t do eroge #261 the anime ( unless it’s unlimited blade works FSN anime, then your ok ). Evil has allies. 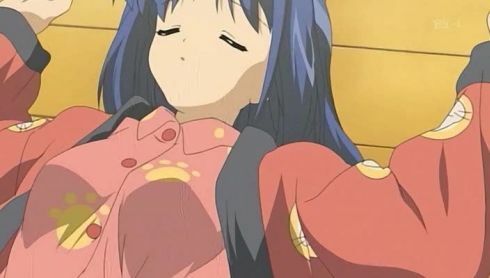 And Akiko suddenly grew breasts. So moe I’m going to die! Sayuri is channeling the power of Mikuru. Love confessions at gunpoint are always fun.